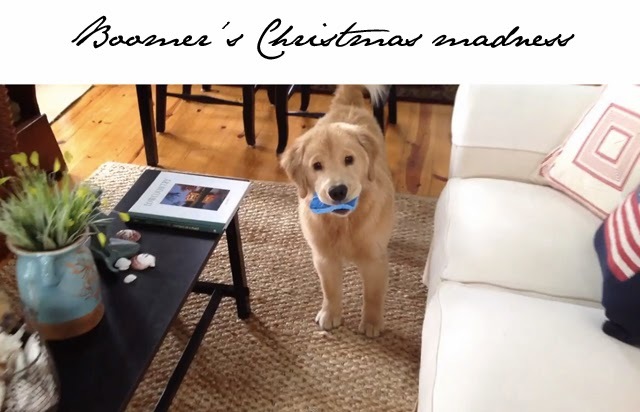 Boomer's Christmas video: He should be getting coal in his stocking, but he's such a cute troublemaker! Where to start when it comes to Boomer. This Christmas was his first and let's just say we're glad we all survived. Who knew a six month puppy could get into so much trouble? Problem here is that every time he was causing trouble, he looked so damn cute doing it. So naturally the camera came out and instead of saying "no," I was pressing the video button and saying, "come here Boomer and show us that cute sponge your stole out of mommy's hands while she was washing the dishes." This dog loves being chased, yet he absolutely hates the camera. All so sad as we had high hopes that Ralph Lauren would come a'calling and ask for him to star in the next campaign. Oh well, seems little (actually, not so little anymore) Boomer dreams of stealing hams off of tabletops and ripping up spanish moss above all else.